Chorley returned to winning ways in some style, putting one of their rival title-contenders to the sword with a display of clinical finishing. Aggborough - home of Kidderminster Harriers - continues to be home from home for the Magpies who have never lost at this ground in four National League North encounters. Harriers disappointed their supporters in a bumper ‘gate’ of 2,090 by offering little threat to Matt Urwin in the Chorley goal, despite a bright opening spell and enjoying plenty of possession. Jamie Vermiglio’s men simply rediscovered their outstanding early-season form, were solid in defence and when the goal-chances came they put them away. "We were superb," enthused the Chorley boss. "We were organised, robust and wanted to win and to get a result like this against one of the best footballing sides in the league is tremendous." Two-goal Josh Wilson’s awareness and intelligent reading of the game were key to the victory. He put Chorley ahead on 26 minutes when cleverly anticipating a Marcus Carver flick-on and running free to fire past Brandon Hall. After regaining a measure of control of possession, Harriers suffered a hammer-blow just before the break when a well-worked second goal put the Magpies in the driving-seat. Persistence down the right led to Elliot Newby receiving the ball and cutting inside before dispatching a lovely curling shot into the bottom corner of the net. Kidderminster might have pulled one back soon after the interval but from an inviting centre Ashley Chambers made poor contact with an attempted header which drifted well wide. Yet it was the visitors whose attacks carried the greater conviction and they went three up on 58 minutes. The goal was gift-wrapped. The ever-alert Wilson pounced on a terrible clearance from Hall and exchanged passes with Jake Cottrell before stroking the ball into an empty net. Wilson was involved again in the fourth goal in the 68th minute. Only a brilliant save by Hall prevented his header from bringing him a well-deserved hat-trick but the ball looped up behind the keeper and Andy Teague had the simplest of tasks in ushering it into the net from almost on the goal-line. 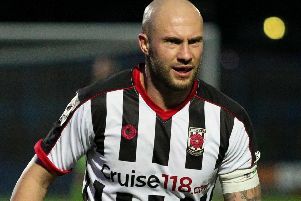 Chorley saw the game out with the minimum of fuss, the only hint of a consolation goal for the hosts a well-struck shot from substitute Sam Austin which Urwin punched clear. Only a very late flurry of three goals by leaders Bradford Park Avenue to overturn a 0-2 deficit prevented Chorley from returning to the top of the table but the Magpies boosted an already impressive goal-difference by this big victory and are just one point from the summit with two games in hand. CHORLEY : Urwin, Challoner, Blakeman, Teague, Meppen-Walter, Jordan,Cottrell, O’Keefe (Glynn,85), Carver, Wilson (Almond,75), E. Newby (Whitham,72). Unused subs. A. Newby, Anson.